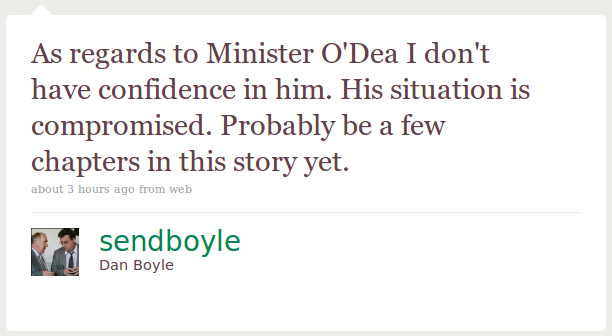 Green party senator Dan Boyle used his twitter account to express his frustration after the government won a Dáil vote of confidence in Defence minister Willie O’Dea earlier today. 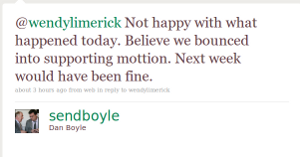 The Cork-based politician said he was “not happy with what happened today” using the online messaging service. He said he believed the junior coalition party was “bounced into supporting the motion”, tabled by Fianna Fáil amid controversy over comments O’Dea made in an interview with a local journalist before the last general election. Willie O’Dea later reached an out of court settlement with Sinn Féin councillor Maurice Quinlavin over the affair. O’Dea initially said in a court affidavit that he did not make comments falsely linking the councillor with a brothel. But after journalist Mike Dwane produced an interview tape, Mr O’Dea said it jogged his memory and the affidavit was false. The government won the vote of no confidence comfortably, by a margin of 80 to 69. Green minister Eamon Ryan spoke in support of Mr O’Dea during the debate.